We seem to be in a cycle of either sweating or shivering during neighborhood events, but despite the cold for Glass Street LIVE 2017, the community huddled together to sip hot chocolate and enjoy fresh BBQ at Ms. Tee’s, or warming up and socializing at the impromptu fire pit. Right away, some party goers got warmed-up by moving to the music at the main stage sponsored by ArtsBuild, starting with local neighbors, 2 Deep Within. Others, like our neighbor Gail Mitchell McKeel found ways to warm up by actively painting crosswalks at the Dodson Ave. and Glass St. intersection with artist Matt Dutton, who stenciled Hardy Elementary’s eagle mascot with temporary paint after Gail and local kids, Shemari, Zoreyah, Zareyah and Jordan rolled out the purple colors in temporary corn starch paint sponsored TAC. After weeks of hard work, it was exciting to Grow Hope Urban Farms’ mobile farm stand used according to its design: to increase fresh food options along with use by local vendors like Tina from Ashanti’s hair designs who used one of the tables to sell her famous lemonade. Non-profit partners lined their booths along Crutchfield Ave. between Ms. Tee’s BBQ and the Sunnytown lot, so neighbors could easily access popular interactive stations like the giant chess game from the Chattanooga Public Library, low-voltage bulb-tester displays from green|spaces Empower, and handprints or personalized messages on the beams for Habitat for Humanity homes in the neighborhood. Over 60 local residents spent time sharing their input about changes they want to prioritize for intersection improvements at the Glass House Collective booth with special large format representations of the intersection area where participants could place stickers that represent where they would prioritize benches, lighting, or tree wells to help make the intersection cleaner, safer, and more inviting to foot traffic and neighborly mingling. Parents were often occupied discussing the streets and sidewalks, or engaging in artistic impressions with the 800 Project artists or with Andrew Mollenkof from Build Me A World. So the kids either stayed entertained with a larger than life JENGA set built by Matt Dutton from large cardboard boxes or got their wiggles out in the inflatable bounce house. Local artists transformed the Alabama Furniture building into a pop-up gallery space, featuring original work by a group of young (mainly UTC student) artists calling themselves Art Trap Collective. Many partygoers fell under the calming spell of the music combined with dreamscape paintings or photography. Near the large picture windows facing Dodson Ave., Leo Ascarate or Our Luck printers set up a shirt screen-printing station which was a huge hit with kids and adults alike. Meanwhile, the main stage hosted some of the areas finest musical performers like YKC Nation, a dance-off with Image and Skream, Differentdiva, DJ D-Whit, Kay B Brown, and emceed by C-Grimey. Again, thanks to ArtsBuild for the funding to invest in our local musical talent. Skaters were invited to try test their skills on the rails and jumps set up in the street, and until it got too cold for their engines, DJ LV had his crew out to show their classic cars, trucks, and bikes. Near the music stage, Boyce Station Neighborhood Association greeted guests and party-goers and proudly displayed their brand new sign. Nearby, friends of all ages, sizes, and colors, warmed up by gathering with Manny Strickland on his converted lounge bus called The Midnight Puff. The Friend Up parties organized by Eddie Yancey and Mary Helen Montgomery are all about getting friends together with a range of cultural backgrounds, and their goals were well aligned with the variety of diverse friends gathered Sunday in the spirit of friendship and common good. That bond was celebrated in the colorful community parade, which may have lacked volume without the drum beats we had hoped for, but still included cheers for our neighbors and partners, and bright hand-welded art bikes from Art 120 made last summer at the East Chatt YFD. 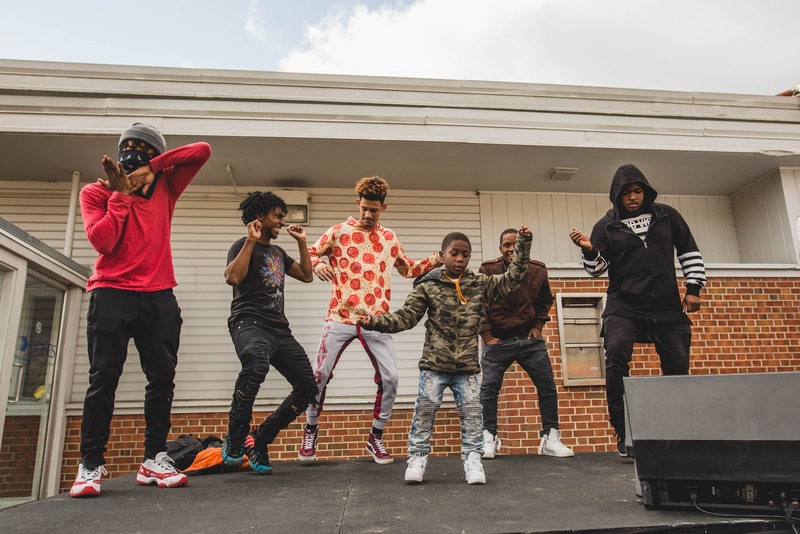 For the grand finale of the party, dancers took center stage after they wrapped up the end of the parade, with a contest that included some of the Zy’Mori Studios dancers along with local kids– with music from DJ D-Whit. 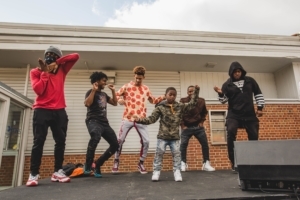 Overall, the intersection looked great packed with people and energy, and lined temporary trees installed in specially built planter boxes made by Shawnquell, Christian, and Amari, with Rondell Crier’s guidance, at Studio Everything. We’re so grateful to Shannon Burke of City Celebration for collaborating on this event, and a big thank you to our 2017 Glass Street LIVE sponsors: CHI Memorial, Tennessee Arts Commission, Pinnacle Bank, Office Furniture Warehouse, EPB of Chattanooga, The Mark Hite Team | Keller Williams Realty Downtown Chattanooga, Coca-Cola United, and Whitney Drayer. And to the whole collective of dedicated, creative, and ingenious partners who make events like Glass Street LIVE possible, even in the blustery cold! We’re proud to join you! Enjoy this beautiful footage by Make Beautiful capturing the joy of the day!